Bottles of an “incredibly rare” Moray single malt will be sold to mark the 20th anniversary of a distillery and raise more than £500,000 for charity. The Benromach Distillery was reopened in Forres in October 1998 by the Urquhart family, following many years of closure. Prince Charles was on hand to lend the first cask his personal seal of approval, as he signed his name on the lid. Whisky taken from the Duke of Rothesay-endorsed cask will now be sold to mark the business’s two decades of success. And all proceeds from the limited edition Benromach Cask No 1 expression will be donated to charitable causes. 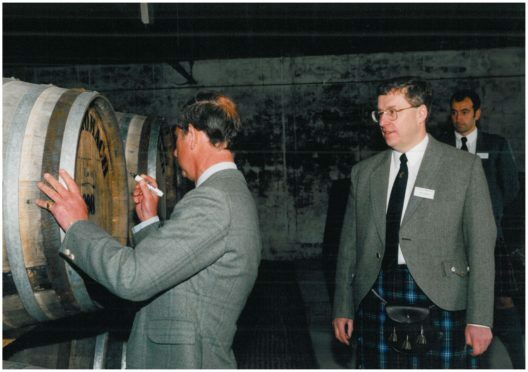 Benromach Distillery manager Keith Cruickshank joined the firm that same year as distiller and looked on as the royal visitor toured the premises. Mr Cruickshank said: “I was proud to witness The Duke of Rothesay sign the first cask of our own distilled spirit 20 years ago. “This single cask offers whisky lovers the chance to own an incredibly special moment in the history of the Benromach Distillery. Ewen Mackintosh, the managing Director at Gordon and MacPhail, which owns Benromach Distillery, said it was “fitting” that proceeds would be donated to charity. All 575 bottles of the malt will be sold through Benromach Distillery’s Visitor Centre with a recommended price tag of £1,000. Originally built in 1898, Benromach Distillery was brought back to life when the Urquhart family purchased it in 1993. The distillery was extensively revamped over five years before it was officially opened on October 15, 1998, the Duke of Rothesay. The whisky was bottled on August 21, exactly 20 years after the cask was filled. Pre-orders can be placed from today, with decanters available from October 15. Its flavour is described as “succulent blackberries and stewed damson plum, with a hint of roasted hazelnut and charred oak on the finish”. The small team of distillers manage the process by sight, sound and touch.